I am loving the support for older mechanics! Yes! The conspiracies are brutal but I can see them already in a number of different builds, and they can all affect AOs. 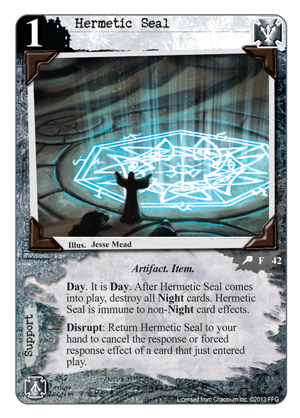 Also, Hermetic Seal can cancel Nug. Can't wait for that. 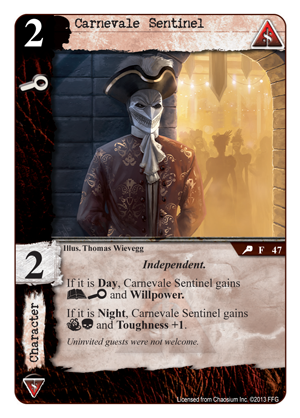 I'm already envisioning a Syndicate deck with Furtive Zoogs. so what? This is not a faction expansion like the last two.. but a general expansion in addition to the faction ones we were expecting? This is kind of genius really.. as dreamlands is coming into reprint as well.. so all the day-night effects will be hitting everyone at teh same time. This is a pleasant surpise. I like the new theme! 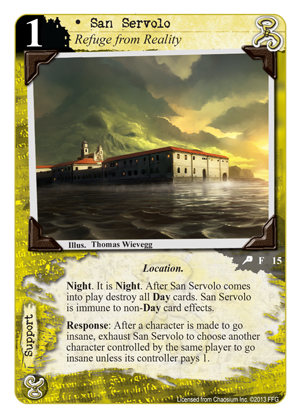 It's clever to introduce cards that are immune to non-Day/Night card effects. As long as those cards are good, you're basically forced to include at least some Day/Night cards to deal with them. I dont think forcing players to have counters is good idea, but those cads look really interesting and reintroduction of day/night and conspiracies powerfull enough to actually be played, and more interesting dynamics (stories in 3td set are quite bleak IMO)... love this pack. That's a great point. I was looking forward to the Dreamlands reprints especially because of their focus on Day and Night. Increasing that mechanic's presence even more with a boxed set is fantastic. Now that Day/Night mechanics will be more prevalent, do you think an Agency Day build will be more viable? IMO Syndicate will come out in a lot better position because it will be able to handle both, like the Spock to Rock and Scissors. Regardless, I love the support of old mechanics, and I'm all for making cards that increase the relative viability of older cards, which enhances the depth of the game, not just the breadth (i.e. new power cards, new mechanics, etc.) 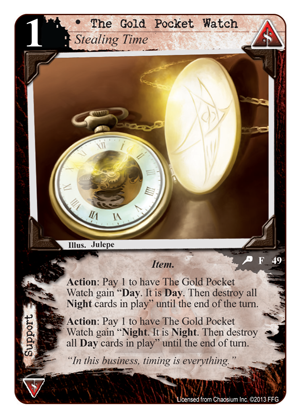 Day/Night has been overshadowed because there are more efficient regular cards than having to worry about building in combo cards into your deck, but with this addition, you are either going to have to worry about teching against it, or going with the flow. Which is why I think Syndicate may come out the winner from this expansion since they can play both sides with minimal risk to their deck falling apart. Please, FFG, don't make us wait an additional 2 or more months for this. Please get back on track with the release schedule!!!" I don't currently play this but I have been thinking about picking up the game and Syndicate appeal to me from what I have seen in this preview. It's looks like you play everything else! Why not this? Lol. I only really actively play Netrunner, AGoT and SW. I have played this once before few months ago. I'm not a big horror fan which is what kind of kept me away. Eh, the theme gets some hooked, but to me it's more like an episode of Fringe or a James Ellroy novel. Horror in Lovecraft's universe has always been more "Hitchcockian" than "Scream 8." There's some weird stuff, some really weird stuff, in these cards, but mostly it's about hard-boiled P.I.s, mobsters, lunatics, monsters, and (for all intents and purposes) aliens. It is a really cool game compared to the other LCGs, since this one really allows you to explore deckbuilding a lot more than in AGoT, and much more than SW. I'm really surprised that more competitive players don't explore this game, since it has just as many if not more tactical decisions as AGoT, and it tends to be a lot quicker too. But I guess it doesn't have the shiny IP. Check out the top ten list for Syndicate to see what that particular faction's strengths are. 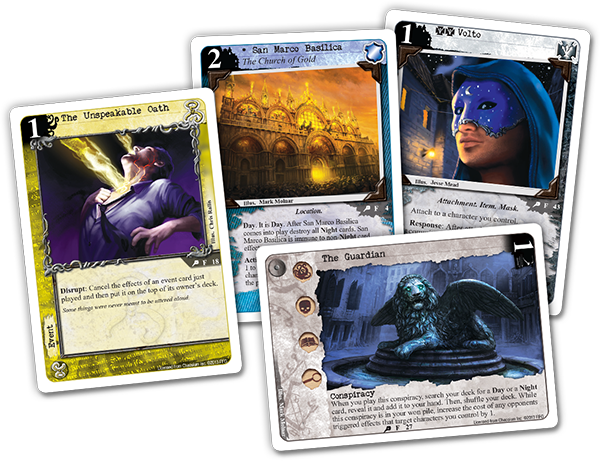 It is a really cool game compared to the other LCGs, since this one really allows you to explore deckbuilding a lot more than in AGoT, and much more than SW. I'm really surprised that more competitive players don't explore this game, since it has just as many if not more tactical decisions as AGoT, and it tends to be a lot quicker too. Not to further derail my own thread, but could you elaborate on that ? It has my interest. Sure! 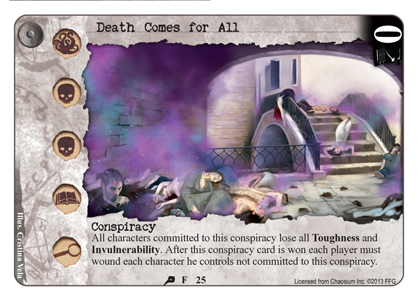 In terms of deckbuilding, in AGoT you are mostly limited to the house that you play. This is a sort of "macro-level" restriction which means that your effective cardpool when building a deck for any particular house is more or less one-sixth the overall cardpool. In CoC, there are no such "macro" restrictions which means that your effective card pool is...the entire cardpool. Most players tend to limit their decks to two factions, but it is possible to do 3 or more faction decks. Every time I go through the card pool on the search engine or just read through my cards, I discover new and interesting interactions between cards from different factions. In my opinion, this takes a lot of the emphasis off of what AGoTers call "Jamie" style deckbuilding, since the inherent nature of deckbuilding in CoC stresses card interactions. There are almost 100 different faction combinations you could do, with a myriad different card permutations within each combination. In terms of tactical decisions, I feel that the three different challenge types (not to mention the dominance phase) is what makes AGoT shine as a game. 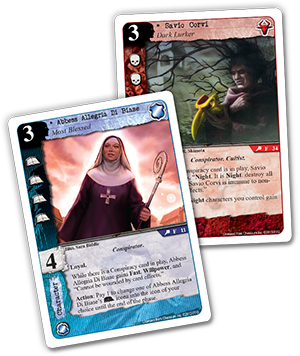 AGoT allows you to pick and choose which challenges you want to let through; but since the board changes dramatically from round to round, it's much more about making the most of each individual challenges phase to maintain absolute card advantage. CoC has this is a slightly different but equally engaging form. Each time you commit to a story you have to think about how you will mitigate the effects of the 4 struggles, but all at once, and you're not safe from "claim" of struggles as the attacker. Simultaneously, you have to think a step ahead for your opponent's next turn. AGoT is a little more forgiving for power, so you see a lot of people leaving challenges unopposed in order to swing back to get power when they attack, but in CoC the stories act as threshholds - it's as if once you get to 5 power, you can't go below 5 power. This is what makes stories more critical in CoC than any individual challenge in AGoT, but also why CoC games tend to be faster. This gives the story phase in CoC a lot of pressure, and requires you to constantly think about maintaining enough board position to not fall too far behind. I am a little hesitant to over simplify it, but think about the mechanical differences between AGoT and CoC. 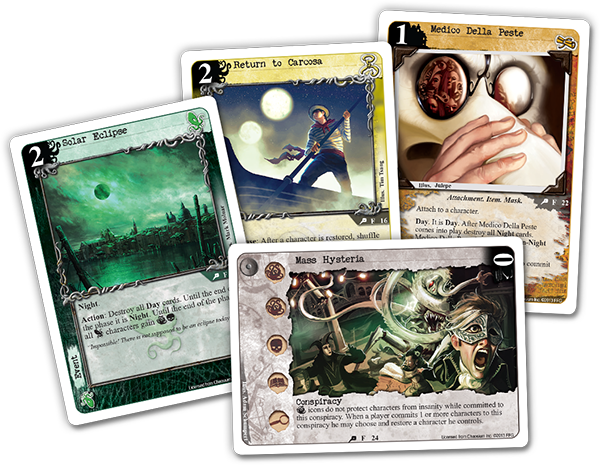 AGoT has a draw cap, relatively easy-obtained resources, a random discard mechanic, and ubiquitous reset mechanisms. CoC has no draw cap, relatively limited but scaling resources, and no real ubiquitous resets. This translates to me that AGoT is about absolute card advantage, while CoC is about relative board advantage. It's a slightly different way to think about approaching deckbuilding and playing the game. Thank you. You could probably turn that in to an article. Speaking of articles, how would one begin to write articles for CoC here on this site? Who would I need to cnotact? Oooh! More Day and Night cards! I've they'd reprint the Dreamlands cycle, I'd be even happier, but this is a close second! The first Dreamlands pack is currently on the schedule as a reprint. Well, excuse me- I have a lot of drinking and dancing to do now, to celebrate!